The question that’s developing in your life is one of the most meaningful that a human can ask: does the work I do every day really represent who I am inside? Other people seem to put this question aside. 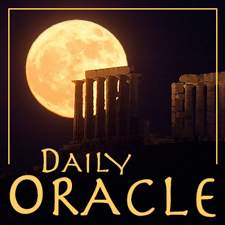 Today’s Oracle takes us to the Scorpio monthly for March 7, 2006. The question that’s developing in your life is one of the most meaningful that a human can ask: does the work I do every day really represent who I am inside? Other people seem to put this question aside. We all hear grim stories of why people do certain kinds of work, that involve no part of their inner truth. You do not have this luxury, and you can be happy about that. The cosmic forces are guiding you firmly toward an exact alignment between the concepts of “who you are” and “what you do.” Don’t be afraid to make any change you need, because these chances don’t happen often.